Go big, or go home. Situated between the Matterhorn and Mont Blanc at a height of 5,000 feet, a Verbier ski vacation offers one of the largest ski areas in Europe. If you’re in search of a happening ski town, incredibly scenic Alpine peaks and some of the most renowned Swiss skiing, you will certainly be pleased on a Verbier ski trip. This delightful village is located on a sunny plateau, in the grand circuit of the Four Valleys ski areas—linking Verbier to Nendaz, Veysonnaz, Thyon. 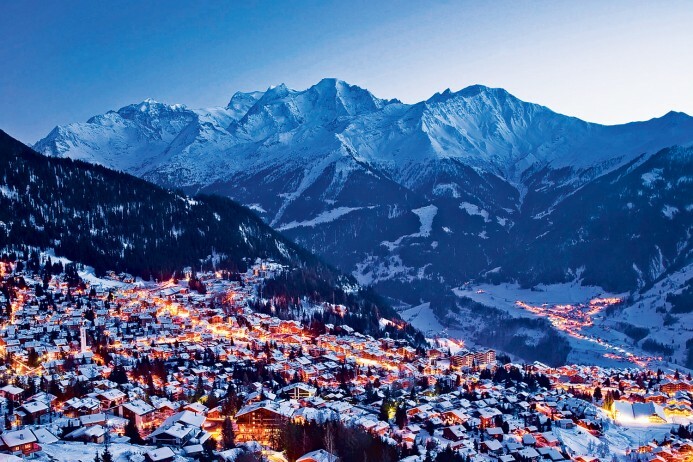 Verbier offers its visitors 60 restaurants, 15 nightclubs and pubs, ensuring that every evening preference is tangible. The village’s ultra-modern sports center provides visitors the best off-piste activities as well, including tennis, squash, ice hockey, curling, skating and swimming. For non-skiers, nearby cities such as Montreux and Lausanne are easily accessible by public transportation. When we say big, we mean it. Your lift ticket is honored at the Four Valleys’ 90 lifts, serving over 250 miles of ski runs. You could ski at this sprawling resort network for a week and never ski the same run twice. Intermediates surprisingly have the most options, so long as they aren’t afraid to venture into “unpatrolled” areas, which are, in fact, quite mellow. As an annual host to the Freeride World Tour—an elite extreme skiing and snowboard competition—you can bet that Verbier skiing will challenge the best. Experts will find that Verbier has a lot of off-piste runs and moguls. Experts will want to hire a guide to explore Verbier’s famed off-piste routes. This ski area’s 11,000-foot summit Mont Fort’s fast and modern lifts open up some of the steepest lift-accessed skiing in the Alps, and also provides breathtaking views of the Matterhorn, Mont Blanc and Dent Blanche. The closest airport for ease of access to Verbier is Sion at 15 miles away. A 6 seat Cessna Citation CJ2 jet from London to Sion is approximately 1 hour 20 minutes. A larger 8 seat Cessna Citation XLS will complete the journey in 1 hour 15 minutes. The Drive time will take approximately 50 minutes due to the mountain roads. A helicopter will get you there in 20 minutes. Arranging a private jet charter or helicopter transfer with Freedom Air to arrive in style to Verbier is simple. The Freedom Air team can be reached on +44 (0) 1275 548001 to book your next trip.